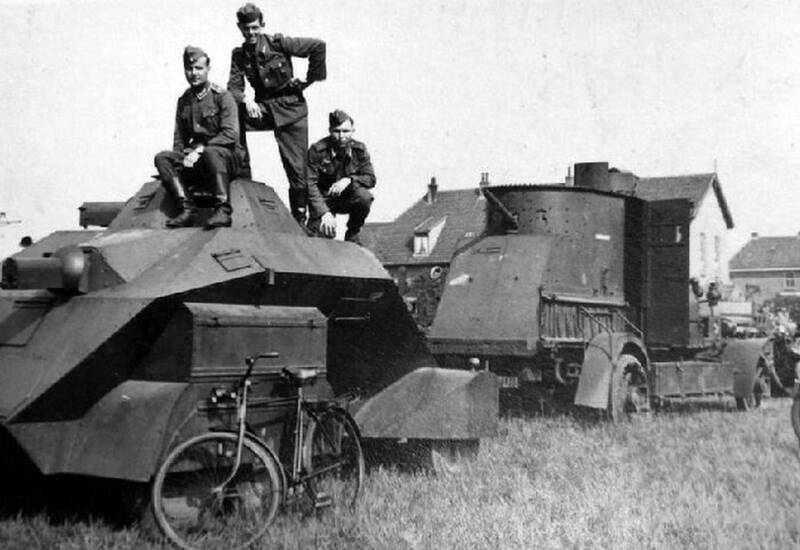 At the end of the twenties, the Dutch military slowly began to realise the importance of armored vehicles and their off-road capabilities. They developed a tactic that lighter armed armored cars should be used together with infantry to give close support, but the Royal Army (Koninklijke Landmacht) didn’t take big steps in buying new vehicles. Meanwhile, the K.N.I.L. (Royal Netherlands East Indies Army) was far less conservative in buying new vehicles. 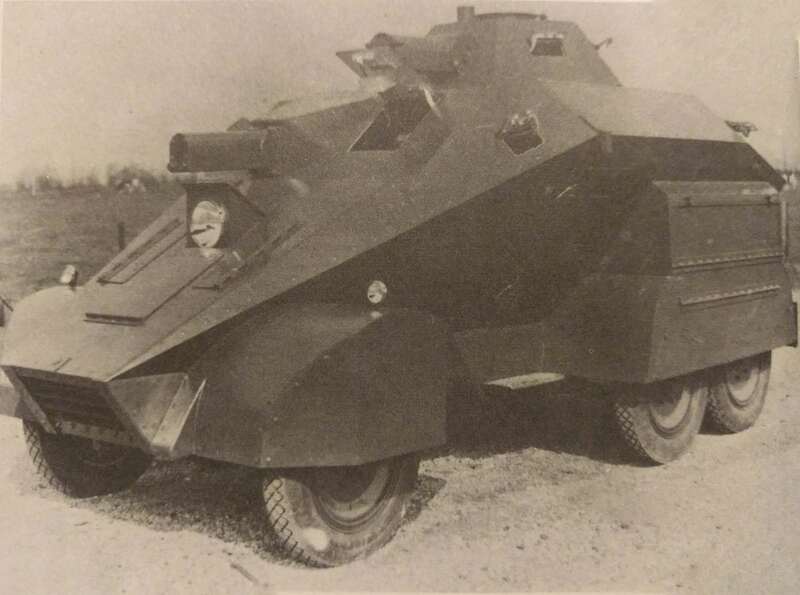 In August 1933, the Dock and shipyard company Wilton-Fijenoord Limited, based in Rotterdam, signed a contract with the Ministerie van Koloniën (Ministry of Colonies) to deliver three armored cars to the K.N.I.L.. These cars were designed upon a Krupp chassis. Plans were made to deliver three more cars a year later. On the 26th of April 1934, the first out of two cars was shipped to the Dutch Indies by the steamship Kota Tjandi. The car was armed with three machine guns, probably the Lewis M.20 6.5 mm, of which two were mounted in the hull and one in a fully rotating turret. This turret could be turned by pedaling so the gunner could use both hands to handle the gun. Additionally, an anti-aircraft machine gun could be mounted on top of the vehicle. The machine guns in the hull had a traverse angle of 25 degrees to each side. The crew consisted of at least three people, two drivers/gunners, and one commander/gunner. If needed, the crew could be scaled up to five people, so the two hull-mounted guns could be manned by other men. If needed, the exterior of the car could be electrified so enemies or rioters could not make contact with the car. A small hatch was installed in the bottom plate, through which lachrymatory gas grenades could be thrown. The armor was resistant to 7.9 mm S.M.K. (Stahlmantelkern) bullets from 30 meters distance. The designers tried to avoid vertical placed armor plates and the use of high-quality steel led to a good trade-off between weight and protection. The total weight of the car was around 4.5 tons. Horizontal armor plates were also avoided to reduce the chance that thrown grenades could land and stay on top of the car. The crew could enter through three hatches and the drivers had closeable openings to see, but when they were closed, the drivers could see through small slots, covered by safety glass. The commander also had a periscope to have a view of the complete surroundings. The engine was a Krupp four-cylinder, air-cooled engine producing 60hp (44.7 kW) at 2500 rpm. The engine was horizontally opposed and equipped with special cooling rings along which air was blown by a compressor which could blow around 1000 liters of air per second. The fuel tank had a capacity of 60 liters so the car could drive a distance between 250 and 300 km. Power was transmitted by a single disc clutch and an Aphon gear change with four forward gears and one reverse gear. The car was equipped with an extra gear change for better off-road capabilities. As a base, the Krupp 22H143 6 x 6 (other sources state the Protze L2H43) chassis was chosen. It had three axes and six-wheel-drive and had theoretically good off-road capabilities. Maximum speed was around 70 km/h (43.5 mph) on road and around 30 km/h (18.6 mph) off-road. The car had one driver in the front and another in the back. The smallest turning circle was 4.4 meters. The four back wheels were equipped with hydraulic brakes. Both on the front and the back, spotlights were installed, which could be folded into the superstructure. Eight lamps were installed on the inside. The tires were made of solid rubber and bulletproof. In the two boxes above the back wheels on both sides of the car, tracks were stored, which could be applied on the two back wheels, resulting in better off-road performance, and essentially making it a half-track. When the car was tested in the Dutch counties of Noord-Brabant and Limburg, no problems occurred. During the tests of two vehicles in the Dutch Indies, however, severe problems were encountered. Firstly, it was too heavy for the local roads. Secondly, the motor heating was too excessive so kerosene had to be used, instead of common gasoline. Because of these problems, the delivery of the third vehicle was canceled and all three vehicles were brought back to the factory. The two cars in the Indies were sent back to the Netherlands. 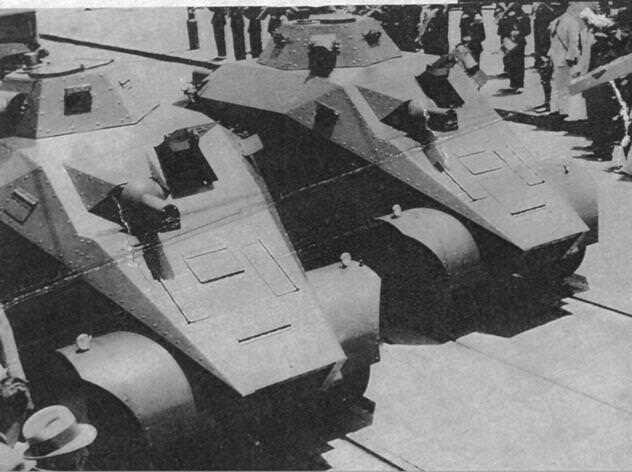 In February 1935, two out of three were sold to Brazil, together with a few Ford/Wilton-Fijenoord APC’s, where they were assigned to the Special Police Force of São Paulo. The three machine guns were removed and replaced by a device which shot lachrymatory gas or apparently flames. They received a grey color. 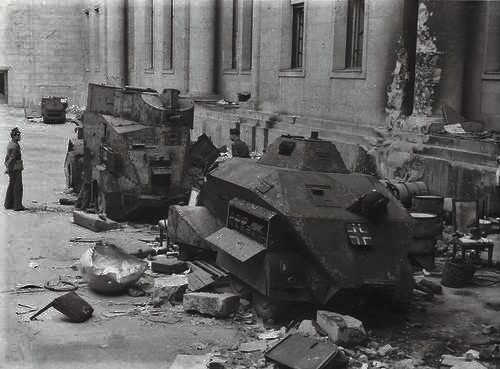 Destroyed Wilton–Fijenoord armored car in the internal patio of the Reichs Chancellery in Berlin. Note the destroyed Schupo-sonderwagen Benz/21 armored police car behind it. The third vehicle, with registration number H66436, was kept in the factory in running order. On the 20th and 21st of March 1936, the ‘Amsterdamse Vrijwillige Burgerwacht’ (Voluntary Civil Guard of Amsterdam) organized an exercise and Wilton-Fijenoord decided to take part. With only two crewmembers, the car was not fully manned and when the car started its exercise, it was immediately stormed by civilians. This had to do with the ‘Jordaan riots’ of 1934 when also armored cars were used. Luckily for the crew, they could electrify the vehicle after which the civilians immediately backed off. When it drove back to Rotterdam after the successful exercise it was stormed again, so the car had to defend itself again. Back in Rotterdam, they had a collision with a civilian motor car, causing more commotion. 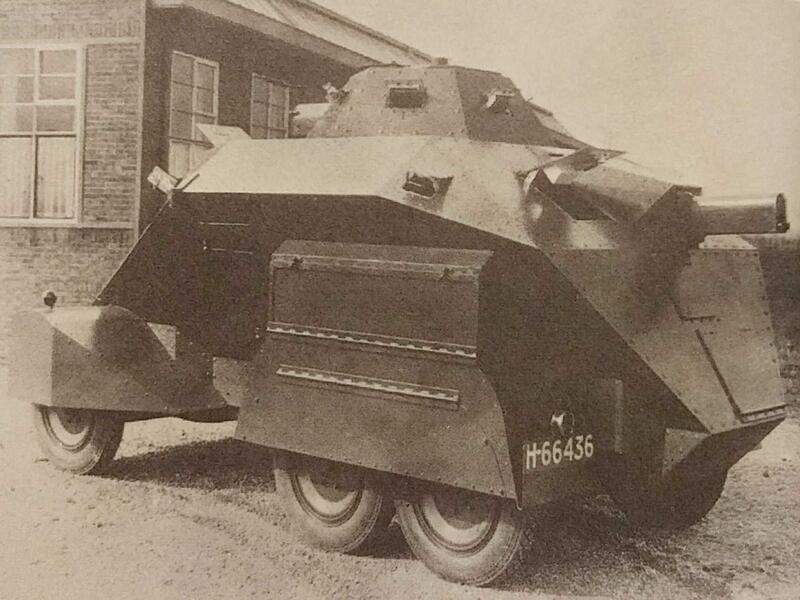 Although the Royal Army already showed interest in 1934 the decision was made not to buy it. Four years later though on the 1st of June 1938, it was sold to the Army as part of a tax deal, and assigned to the ‘Korps Rijdende Artillerie’ (‘Corps Mobile Artillery) but was unarmed. Negotiations with DAF about arming the vehicle stalled and the vehicle was not used in combat during the German attack in May 1940. It was captured by the German troops and was assigned to the Ordnungspolizei. The Germans used it eventually in the defense of the Reich Chancellery internal patio during the Battle of Berlin in 1945, where it got destroyed by Soviet forces. Dr. C.M. Schulten & J. Theil, Nederlandse pantservoertuigen.